Image caption Nicola Sturgeon themed her speech around the word "inclusion"
There are moments which try the soul. One such, as I recall, was discussed recently in the estimable Herald Diary. The topic in question was a football match. The scene envisaged was the stand at a home match involving Borussia Munchen Gladbach. 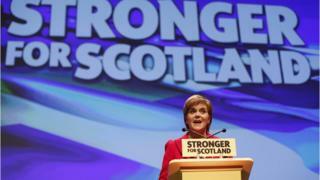 All is going grand until some particularly enthusiastic fan opens up with a chant of "Give us a B….."
Nicola Sturgeon essayed a very different version of that challenge today when she advised delegates that the big theme of her speech was a word beginning with I. No, not that one, she swiftly told the packed hall. The word she had in mind was "inclusion". Ms Sturgeon then deftly contrived to deploy that word in a range of ways. Firstly, she sought to contrast the Scottish government and Scotland with what she characterised as the emerging xenophobia of the UK Conservative administration. It is a dichotomy which sundry speakers - including the FM in her Thursday address - have sought to project. It is, needless to say, challenged by said UKG. Secondly, she turned it into a policy function. Her voice close to breaking, her countenance close to tears, she referred to audience members in the front row who had been through the care system. Too often, she said, the system was about stopping things - while she acknowledged the need for controls and safeguards. She described the problems which sometimes confront those in care while promising a full scale review of the system to enhance social inclusion. Then, more subtly, she deployed her I word with regard to Brexit and the prospect of indyref2. Those who supported independence, she said, must understand and respect those who took a different view. In our live coverage of the conference, journalistic colleagues offered the view that this was, at least in part, a rebuke to those within the wider independence movement who are perhaps somewhat blunt in their assessment of rival opinions, particularly on social media. Equally, though, Ms Sturgeon was setting out a strategy. Zeal alone, she was arguing, will not win the day. It would not overhaul the deficit which emerged in 2014 when independence was last put before the people in a referendum. It was important, she argued, to understand why people resisted the pitch. Stating the offer more vigorously and strenuously would not prove sufficient. To exemplify this, she told delegates that she felt on the day after the Brexit vote that part of her identity had been withdrawn. In a similar way, she urged her party to understand how those who felt a British identity in Scotland might have felt had the 2014 plebiscite produced a Yes vote. Not simply for sympathetic reasons. But strategically.